For $2.99 you can get five 1.05 oz pouches of cereal. 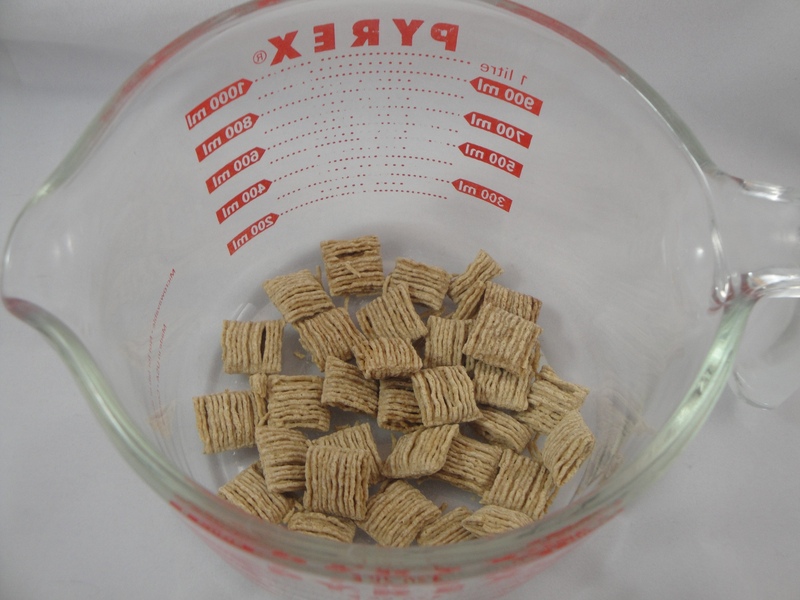 That is not very much cereal, considering a small box of Cheerios has over 11 oz in it. These stand up cereal pouches are good for the waistline, but hard on the budget. Quaker Snack’ems™ come in different flavors, including: Cap’n Crunch Berries, Life Apple Cinnamon Crunchtime, Brown Sugar Oatmeal Squares and Cinnamon Oatmeal Squares. 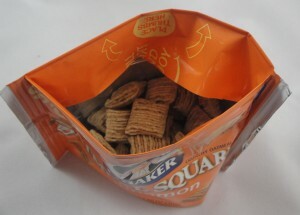 There are not too many squares in a pouch, but enough to satisfy. If these squares were not portioned, I might keep munching on them all morning. $2.99 might not be much to pay for “protection” from overindulgence. BHT is added to this cereal and many others. In the United States the maximum allowed use for BHT in cereal is 50 parts per million (very small amount). Nutritionally fortified cereals contain higher amounts of metals that are essential nutrients (for example Quaker Oatmeal squares has 45% Daily value Iron, 15% Daily value Zinc and 8% Daily value Magnesium). This extra nutrition also provides a catalyst for oxidation reactions; metal speeds up oxidation reactions. Oxidative reactions are of concern in food because they produce off flavors. 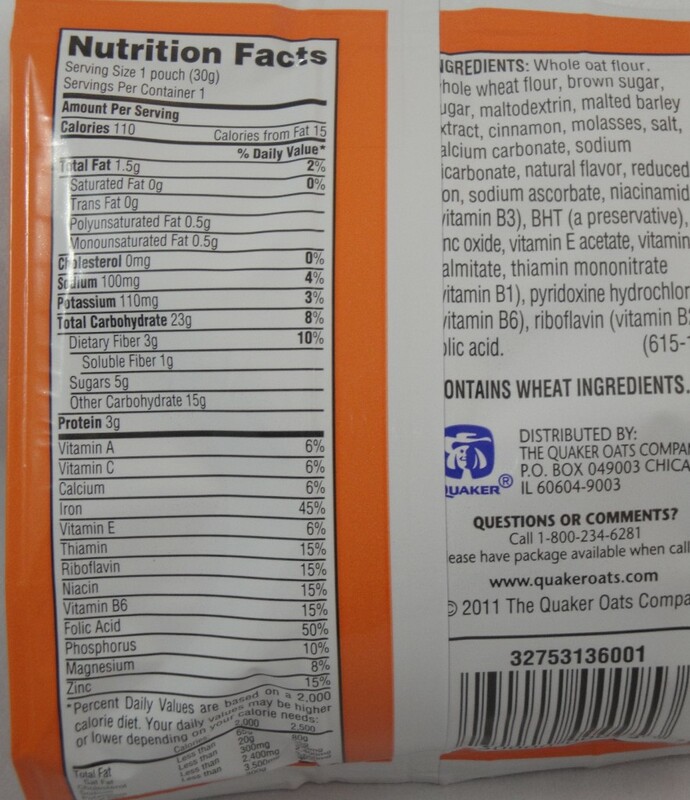 In the case of Snack’ems™ Cinnamon Oatmeal Squares, I detected a light pine off note. The Snack’ems™ I purchased suggests “enjoy by July 22, 2012”. That date is a few weeks from now. 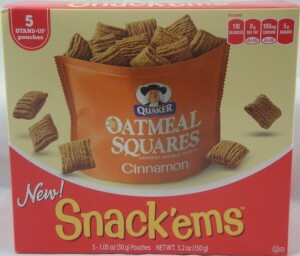 Quaker Cinnamon Oatmeal Squares Snack’ems™ will be a product I will share with my children and hope they enjoy. Breakfast is the most important meal of the day and it can be a challenge to get a child to eat a proper breakfast. These pouches are convenient and fun while the Oatmeal Squares are delicious and healthy.